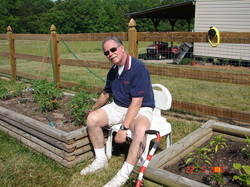 A raised planter makes planting and tending the garden much easier. I can do most everything necessary from my chair. Single handed sewing on a machine is a challenge, but I have been pleased with the end result. I first started sewing canvas covers for my sailboats and canvas tote bags evolved from that. 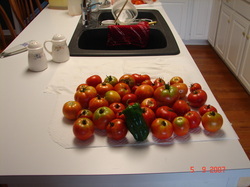 Once the tomatoes start to ripen, we eat them three times daily through the rest of Summer. Using a tapestry material with a beautiful pattern was the next bag style after just canvas. My latest attempt was a bag made from a leather pelt. All in keeping with the positive attitude of Adapt, Improvise, and Overcome.